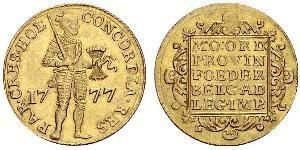 1778, Netherlands, Holland (Province). Beautiful Gold Knight Ducat Coin. 3.51gm! Obverse: Knight standing right in armor, holding sword which rests on shoulder and a bundle of arrows, splitting date (17-78). Legend: CONCORDIA . RES PAR . CRES . HOL . Expanded: "CONCORDIA RES PARvae CREScunt HOL" Translated: "Through unity little things grow (Union is strength), Holland"
Reverse: Legend in five lines inside ornate square. Fields around decorated with floral ornaments. 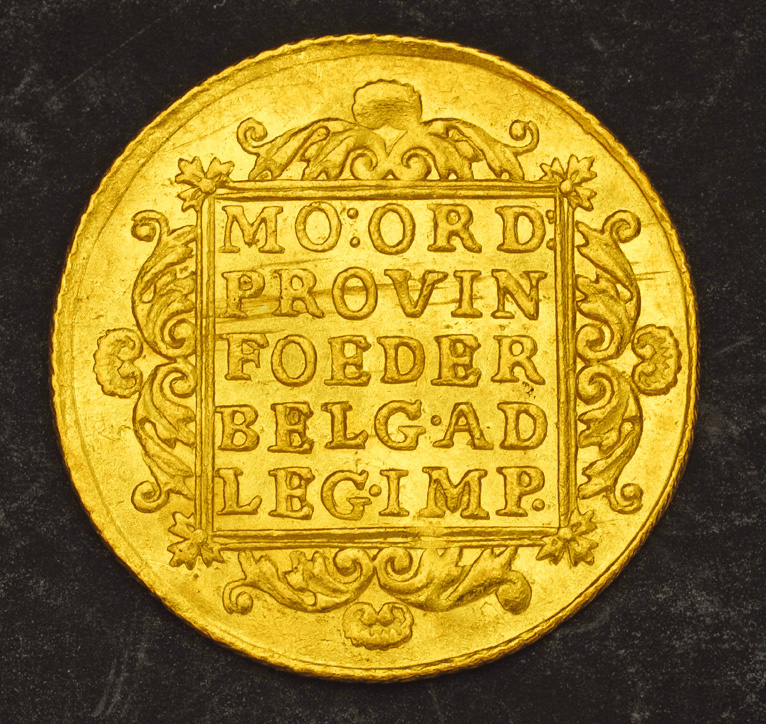 Legend: MO ORDI PROVIN FOEDER BELG AD LEG IMP Expanded: "MOneta ORDinum PROVINciarum FOEDERatorum BELGicarum AD LEGem IMPerii" Translated: "Coin of government of the provincial federation of Belgium Conforming with the law of the Imperial." 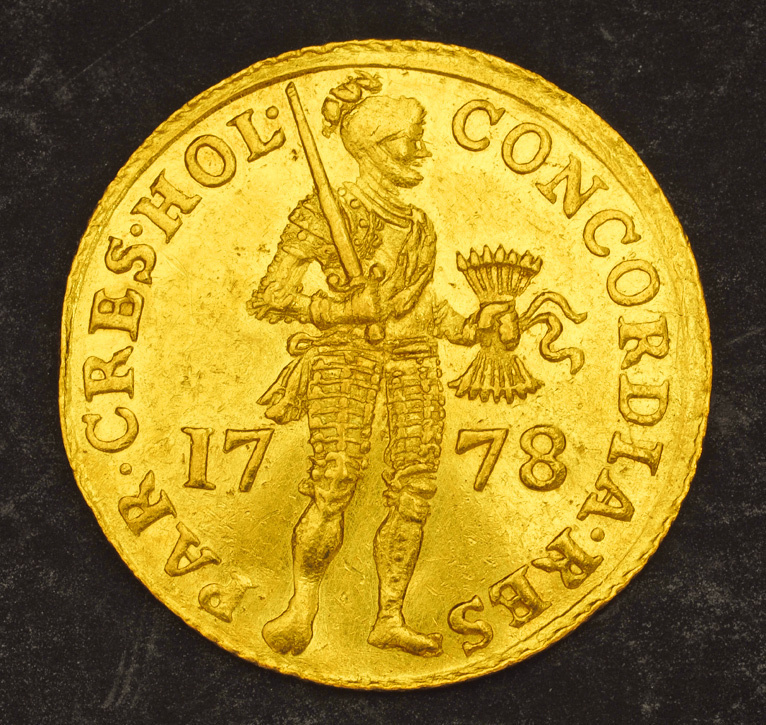 Minted in Holland beginning in the 17th century to fuel its extraordinary tenure as the world's foremost commercial trader, the Netherlands one ducat gold coin offers both strong visual appeal and a scarcity value that could command a healthy premium in the years to come. 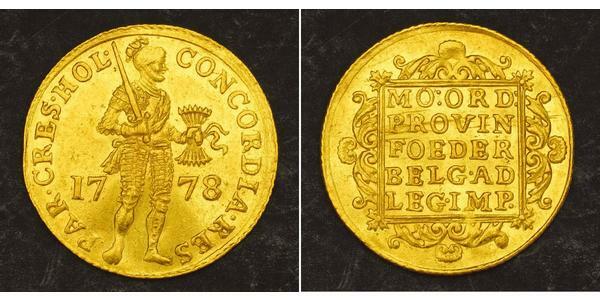 The first Netherlands trade ducat was issued in 1487 under Phillip the Fair and a coin very similar to the one depicted above has been minted more or less continuously from the early 1600s on. 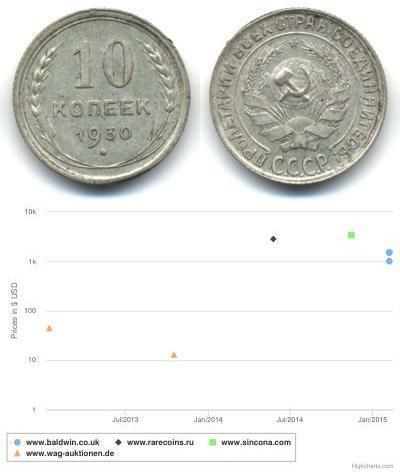 The net fine weight of 3.5 grams gold never changed to the modern era. The trade ducat is minted as a gold bullion coin even today. 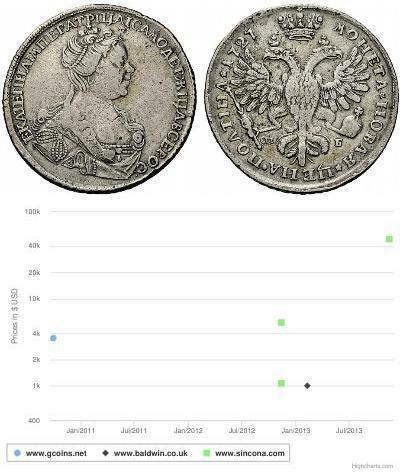 Only the Venetian ducat has enjoyed greater longevity. The obverse of the famed ducat coin depicts a knight holding a bundle of arrows signifying the unity of the six northern provinces under the 1579 Union of Utrecht -- a declaration of independence from Spain. The motto Concordia Res Parvae Crescunt translates to "the union makes small things grow." The legend on the reverse translates to "money of the provinces of the United Netherlands according to the law of the empire." The Republic of the Seven United Netherlands (or "of the Seven United Provinces") (Republiek der Zeven Verenigde Nederlanden/Provinciën; also Dutch Republic or United Provinces in short, Foederatae Belgii Provinciae or Belgica Foederata in Latin) was a European republic between 1581 and 1795, in about the same location as the modern Kingdom of the Netherlands, which is the successor state. Before 1581, the area of the Low Countries consisted of a number of duchies, counties, and independent bishoprics, some but not all of them part of the Holy Roman Empire. Today that area is divided between the Netherlands, Belgium, Luxembourg and parts of France and Germany. The Low Countries in the 16th century roughly corresponded to the Seventeen Provinces covered by the Pragmatic Sanction of 1549 of Holy Roman Emperor Charles V.
Through marriage, war or sale, these states were acquired by the Habsburg emperor Charles V and his son, king Philip II of Spain. In 1568, the Netherlands, led by William I of Orange, revolted against Philip II because of high taxes, persecution of Protestants by the government, and Philip's efforts to modernize and centralize the devolved medieval government structures of the provinces. This was the start of the Eighty Years' War. In 1579, a number of the northern provinces of the Netherlands signed the Union of Utrecht, in which they promised to support each other in their defence against the Spanish army. This was followed in 1581 by the Act of Abjuration, the declaration of independence in which the provinces officially deposed Philip II. The United Provinces first tried to choose their own lord, and they asked the Duke of Anjou (sovereign from 1581-1583) to rule them. Later, after the assassination of William of Orange (July 10, 1584), both Henry III of France and Elizabeth I of England declined the offer of sovereignty. However, the latter agreed to turn the United Provinces into a protectorate of England (Treaty of Nonsuch, 1585), and sent the Earl of Leicester as governor-general. This was not a success, and in 1588 the provinces became a Republic. 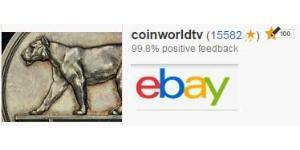 Only 1$ shipping for each additional coin purchased!